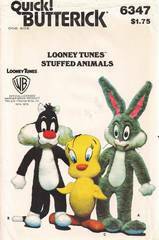 1970's licensed Looney Tunes sewing pattern. Rabbit 22" tall, Cat 36" tall and Bird 31" tall. Use fake fur and felt.